All Christian parents must be careful how you treat your child so they won’t become resentful, disobedient, and discouraged in life. Be careful not to be overly protective of them. Teach them the Word of God early so they will walk in the right path. If you do this it will lead to building trust in your relationship. Don’t get me wrong there is nothing bad about protecting your child, but as children get older and mature they need to have more freedom to make their own decisions. We all must grow in life and step out into the real world. If you give them no freedom to go anywhere or do anything that means you don’t trust them. This can lead to them being rebellious and sneaking out the house. Once again protect, but don’t be overly strict with them. Teach them the Word of God so when they do enter the real world they will make the right decision in life. Encourage your child to do their best, but don’t set unrealistic expectations for them and especially don’t live your life through them. For example, maybe you wanted to be a football star so you pressure your son to play football even though he doesn’t want to. Spend time, laugh, love, help, and encourage them rather than fault finding and criticizing them all the time. Be a positive role model and let’s learn more. 1. Colossians 3:20-21 Children, obey your parents in everything, for this pleases the Lord. Fathers, do not exasperate your children, so they won’t become discouraged. 2. Ephesians 6:3-4 If you honor your father and mother, “things will go well for you, and you will have a long life on the earth.” Fathers, do not provoke your children to anger by the way you treat them. Rather, bring them up with the discipline and instruction that comes from the Lord. 3. Galatians 5:25-26 Since we are living by the Spirit, let us follow the Spirit’s leading in every part of our lives. Let us not become conceited, or provoke one another, or be jealous of one another. Don’t discourage them by insulting them and name calling. 4. Ephesians 4:29 Let no corrupting talk come out of your mouths, but only such as is good for building up, as fits the occasion, that it may give grace to those who hear. 5. Proverbs 12:18 There is one whose rash words are like sword thrusts, but the tongue of the wise brings healing. Stop yelling and being angry at them for every tiny reason. They will grow up to be angry and bitter from picking up on the bad habits of parents. 7. Proverbs 15:1 A soft answer turns away wrath, but a harsh word stirs up anger. 9. Ephesians 4:26 Be angry and do not sin; do not let the sun go down on your anger. 10. Proverbs 22:24-25 Make no friendship with a man given to anger, nor go with a wrathful man, lest you learn his ways and entangle yourself in a snare. Never show favoritism or compare between children. 12. James 2:1 My brothers, show no partiality as you hold the faith in our Lord Jesus Christ, the Lord of glory. 13. James 2:9 But if you show partiality, you are committing sin and are convicted by the law as transgressors. Nothing is wrong with spanking and discipline because they need this to become a responsible, respectful, and hard working adult. There is something wrong with verbal and physical child abuse. 14. Proverbs 19:18 Discipline your son, for there is hope; do not set your heart on putting him to death. 15. Colossians 3:8 But now you must also rid yourselves of all such things as these: anger, rage, malice, slander, and filthy language from your lips. 16. Proverbs 13:24 Whoever spares the rod hates his son, but he who loves him is diligent to discipline him. 17. 1 Corinthians 16:14 Let all that you do be done in love. How would you feel if your parents were overly strict, abusive, angry, discouraging, unloving, and always pressuring you? 19. Luke 6:31 Do to others as you would like them to do to you. 20. Galatians 5:16 So I say, walk by the Spirit, and you will not gratify the desires of the flesh. Encourage them and build them up. Don’t discourage and always complain every second of the day. 21. 1 Thessalonians 5:11 Therefore encourage one another and build one another up, just as you are doing. 22. Hebrews 10:24-25 And let us consider how to stir up one another to love and good works, not neglecting to meet together, as is the habit of some, but encouraging one another, and all the more as you see the Day drawing near. Be thankful for them, spend quality time with them, and show them you love them. 23. 1 Corinthians 13:4-7 Love is patient and kind; love does not envy or boast; it is not arrogant or rude. It does not insist on its own way; it is not irritable or resentful; it does not rejoice at wrongdoing, but rejoices with the truth. Love bears all things, believes all things, hopes all things, endures all things. 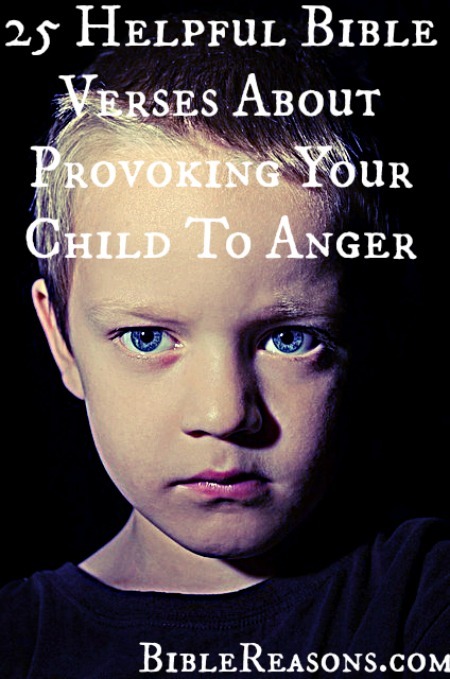 If you’ve been provoking your child apologize. 24. Psalm 51:3 For I know my transgressions, and my sin is ever before me. 25. James 5:16 Therefore, confess your sins to one another and pray for one another, that you may be healed. The prayer of a righteous person has great power as it is working.